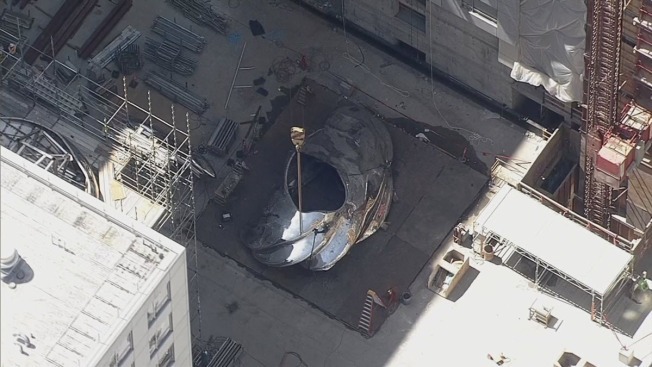 Construction crews using an enormous crane on Tuesday hoisted a key section of a 92-foot Venus statue at the Trinity Place Apartments in San Francisco. The crane carefully lifted the "shoulders" of Venus and positioned the piece on top of the sculpture's "torso." The statue is the centerpiece of a public art-filled piazza in the heart of the apartment complex at Eighth Street between Market and Mission streets. The massive, stainless-steel sculpture, which is slightly shorter than the Statue of Liberty, is part of a collection designed by renowned artist Lawrence Argent. Trinity Place consists of four residential high-rises with a combined 1,900 units. The current Phase 3 under construction is scheduled to be finished by March 2017. Phases 1 and 2 were completed in 2010 and 2013, respectively.